... 1942 (70 years ago today), after 5 months after the attack on Pearl Harbor, a U.S. law setting up the Women's Auxiliary Army Corps took effect. (image credit) President Franklin D. Roosevelt's implementing order is here. 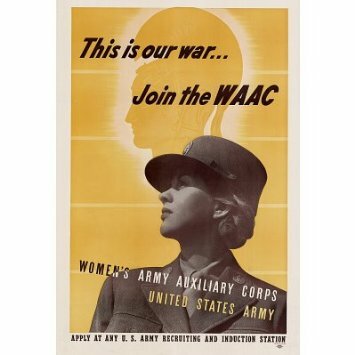 The thousands who joined what soon was renamed the Women's Army Corps -- known as WACs -- served around the world in a range of jobs, "from clerk to radio operator, electrician to air-traffic controller." The legislation had been proposed a year earlier by New England's 1st Congresswoman, U.S. Rep. Edith Nourse Rogers of Massachusetts, who'd previously worked in military hospitals and later would serve as Chair of the House Committee on Veterans' Affairs. The Corps stayed in effect until 1978, when "women were fully assimilated into all but the combat branches of the Army."